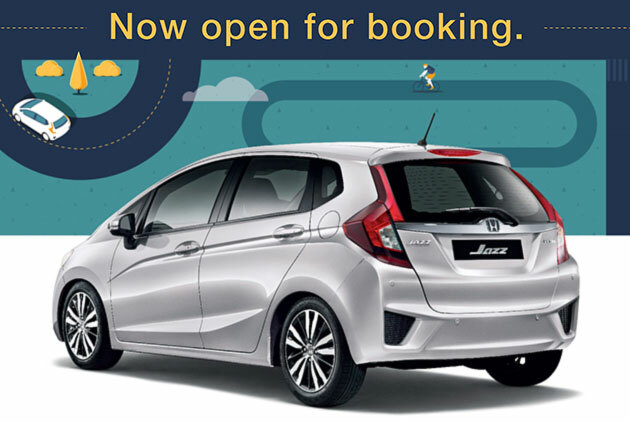 Honda Malaysia has announced that the new third-generation Honda Jazz is now available for booking in Malaysia, and an official launch will be happening by the end of this month. The car was spied late last month on a transporter near Bukit Jelutong. The 2014 Honda Jazz will be available in three variants – 1.5 S, 1.5 E and 1.5 V, in that order in terms of equipment level and expected pricing. This is pretty interesting as it means Honda Malaysia now treats the Jazz as a mass-market model just like the Honda City, which also has a variety of equipment levels. And rightfully so, ever since the previous-generation Jazz was launched as a CKD model with a lower price tag, sales leaped from only 650 units a year on average for the CBU model up to 6,770 units in less than a year for the CKD model. These numbers don’t even include the CKD Hybrid model. Powering the new Honda Jazz is a 1.5 litre SOHC i-VTEC engine producing 120 PS at 6,600 rpm and 145 Nm of torque at 4,600 rpm. This engine drives the front wheels via a new Honda Earth Dreams CVT gearbox – essentially the same engine and gearbox combo as in the new Honda City. The Jazz will continue the interior versatility of the previous-generation models thanks to its Ultra Seats with rear seat reclining. Though we don’t know the full equipment levels of each spec level yet, Honda Malaysia have announced that at least the top spec variant will have six airbags, VSA stability control, Emergency Start Stop signal and Hill Stop Assist (HSA). Bookings made between now and July 15 will be in the running to win a trip to the Maldives, and Honda Malaysia has also arranged for 2.53% financing. You’ll be able to catch it at a preview roadshow moving about town starting from today. Find out where the Jazz will be here. Yup. Ah Beng like new proton compact car..The design is better than this and provided with world class safety feature ncap 5 star..
potong committed will launch it in the second quarter of 2014, right? Yes,go ahead and stay with your Proton junk.Nobody is going to bother Proton junk anymore. All hail 2014 Honda Jazz!! The problem with Proton owner is: It is so difficult for them to upgrade to other cars! Why? The Proton they bought required so much money on repair and maintenance, so it will slash their saving. When they are about to sell off the Proton, they found they can go nowhere because their Proton RV is sooo bad, next to none. With less saving and poor RV, they can only stick with Proton as second car (most of them escaped to Perodua). Proton use attractive car outlook (with recent design contest) to get their victim into the vicious cycle. This trick seems not long working as good as they thought. Kami mesti berwaspada beli kereta ini. Mesti meniliti dengan terpencil bahawa tak ada elemen Yahudi dalam kereta ini walaupun kereta ini Jepun. Kalau ada elemen Yahudi, kereta ini tidak halal. Sila berikan contoh apakah elemen-elemen Yahudi yang berkemungkinan dijumpai di sesebuah kenderaan? Sila beri contoh elemen yahudi. Bangang…Intel got lots of technology came from Israel…Even Microsoft XBOX also come from Israel..
Why you use computer?? Haram wei. Sound interesting if come with right price! hoo..still many buy CKD car..i tot people hate it. What to do.. we are forced to buy them. i thought Made in MAlaysia things are good.. see see they are worst then things that are Made in India. are u du** or retar*** or others? CKD car is still taxed dude..
CKD no import duty and sales tax but once it is assembled only sales tax of 10% to be incurred. so who is the retard here ? All car are taxed. So don’t pretend you are wise unless you are on foot or bus/LRT passenger everyday. Why the tax has caused Malaysian cars so expensive? Because of some people keep on shouting “Hidup Hidup” to the 30 years old junk class car maker. kzm tak mintak special bumiputera diskaun for the Honda Jazz? Mintak lah, mana tau, mungkin boleh dapat diskaun macam rumah. Thai motorcar, expensive fuel but cheap car. But lots of job opportunity from many car manufacture. Malaysia, moderate fuel price, but expensive car. So should we suggest gov to abolish fuel subsidy, and give us cheap cars? Then we don’t have to headache on the smuggle fuel, and come up all stupid ideas on how to abolish smuggle fuel. The subsidy fuel is just RM0.7/litter, not too much provided we pay less for the car on initial stage. Or study from Singapore, let the people know the real car price and let us know the extra tax amount, so we can know how much fund is used for public transport infrastructure etc. I was talking to one Thai friend the other day and she laughed at me and said why Malaysian hire purchase can go up to 9 years? Well, in Bolehland, there’s nothing much you can do as the taxes are so much to collect from cars so the G will increase the fuel price while maintaining car price. Good job..good job… Back in Thailand their fuel is already Euro 4 long time ago. euro 4….and the price is like?……go to 9 years…..and our petrol is like?….zero sum game. enjoy! u dont ask the interest rates? Any communist import tax incentive? But still songlap & buy Bolehland’s subsidized diesel? Preve is one of the ugliest car I ever seen.No wonder so many new City,new Vios and Almera on the road.Nobody is going to bother that Preve junk anymore. Smart people will never have Preve in their mind. They only consider Vios,City or Almera. RIP perutdua lagi best extreme @ RM63k. Still waiting for news of 6 speed manual honda fit (jazz) rs and jazz hybrid to come to malaysia. Yeah, same here, having a vtec engine without a proper manual gearbox, its like missing something overall. And yeah i am a manual driving freak. Now driving a golf, but still using “manual mode” instead of “D” mode. Would it be an EEV now? wat is the L/100km for 2014 honda jazz? It still looks very desirable, to me at least, unlike the current one which is a bit too feminine to my liking. And with those specs and the estimated price posted on Paultan previously, I’m seriously thinking of getting one to replace my 2nd car. When will the 130Hp version arrive in Malaysia? As usual Honda Malaysia being forced to put Jazz price must be higher than Suprima…. Of course..Ah Beng agree if govt increase the price. Japan and Korea been doing the same thing to protect our national car industry..
Hahaha hard to see Suprima junk on the road.Nobody want that junk. Smart people only get Vios,City or Almera. Vios is same type of junk like preve…..only its a high price junk. So its worse than preve actually. Wonder how will Honda Malaysia market this? It can’t be sold to the same target market as the City, or else both cars will be squabbling for sales from the same demographic. So, the Jazz may be marketed as a more sporty fun to drive car, whereas the City is the family hauler. Maybe thats why the City has no paddle shifters, so that it will appear in the Jazz instead? Just a guess, but highly probable in order to further differentiate the 2 cars. Won’t be long before Paultan gets more details on the specs. Seriously you need paddle shift for CVT transmission? No point to have that since you won’t feel the uummmm like the previous City with the 5 speed torque converter. deyyy.. please enclose the price laaa..
Maciam ada sikit suprimak mia DNA. i think, the price would be almost same as existing generation Jazz. more interesting is top spec variant will have six airbags. Although both are totally different segment car, I suspect Honda see market grab coming up soon, faster launch their Jazz. If that is the case then it’s a good sign. About time they ‘lower’ their car price. And see if this will incite our local auto makers to do better to compete. Great Wall M4 is EEV, 16.7km/L. Honda Jazz is not EEV. Everything the same as City so do expect the same BS Quality and BS QC..
Just wait and see and suffer the might of the BQ of Honda BS Malaysia..
dude! never go full retard online! get a freakin life!!!! cant believe salesmen would go through this extent just to kill the competitor? how’s the vios sales? good? no? such a retard! I am not any sales person. Just go get one urself and see the BS BQ and QC of HONDA BS MAlaysia. Just to add on, just only detected last night, sounds coming from dashboard dunoo from engine, aircon or wat..
really du** f*** Honda BS MAlaysia.. REGRETTED like F*** getting HONDA BS MALAYSIA..
Just a desperate Preve or Suprima owner,freaking jealous to see new City flooding the road more and more. “haha” bro,be normal a bit,the way u talk here is like u never own a Honda and talk BS in Paultan forum. Why compare orange to apple? City / jazz has to push pedal hard to get the same speed with Preve / SS, LOL. I got one just last week. Love it. Top notch. Just like the reviews, it beats everything else in it’s class. Sounds from engine? Of course engine got sound. Which car engine no sound??? LOL. Will this be Thai CBU and sold along the current CKD for now? Outside design the back and side curve and line seems following Suprima, however Suprima is better looking. Eh? Correct me if I’m wrong but I thought the Jazz originally had a dual clutch transmission? Dual clutch is for the Jazz Hybrid. Honda Jazz 1.5 Petrol uses “G-Design Shift” CVT. Hi Paul, when honda malaysia launch the hybrid variant? Japan FIT dual clutch problem solved? same pricing as HOnda city. Jazz is not so comfy. better handling but harder suspension. Did you test drive the car? I have tested the previous gen Jaxx many times. Suspension is actually much softer than City. City is known for it’s harder suspension, but latest gen has tone down a bit. I ve booked the car earlier. This will serve my family well and compliment my other car Preve cfe . O/s trips I will take Preve and run about car esp. to the family – Jazz will perform. If you’re really smart, sell your Preve to buy Honda City okay! That is the most stupid to swap Prefe cfe with H.City. I say Jazz is meant for city and short distance driving only. The City sb compared with Saga flx. Either Proton or Honda, Syed Mokhtar win it all. so, cronies eat meat, we eat kangkung. he only has 34% shares in honda malaysia. So you have the other 66%? go and check yourself la who has that. nuub. Honda got government “Special” incentive….Therefore, they set up new production line before new NAP implemented. They (HOnda Malaysia, Syed,etc kangkung member) already well prepare for new NAP. Thats why honda is the first benefited and first Hybrid CKD maker! New Jazz only available for petrol model? When hybrid model will come? DRB slashed the price of Suprima by RM8K(Today’s advert)cos of sluggish sales in proton. DRB wont be selling this Honda cheap.Whatever it has lost in Protong,it shall try to recover as much as possible in Honda. Perhaps,those who booked blindly without being told of the pricing,are preparing for a pricing ranging from Rm80K to 98K,bearing in mind its City is selling well. Simple logic will tell you the price of Jazz will be similar to that of Honda City. The price you quote is unthinkable for 1.5 mass product ckd car. Of all you know, it could be cheaper also. when the car is launched, come back here and read your own comment again then you will realise what a fool you are. no paddle shift?no auto cruise?no reverse camera?really??? Wow. This new Honda Jazz is so beautiful. I can’t wait to see the specs of this beauty car. Saya pengguna Jazz Hybrid CBU edisi sebelum yang ditunjukkan di atas. 2) Stereng superb. ringan utk parking, tapi bila bawa laju kita rasa kawalan tepat. 5)saya suka maintainance murah. minyak fully syntethic 0-20w hanya RM100, oil filter RM15. Better buy peogot 208, VW polo or fiesta @price 80k-90k. All this car give more value in term of HANDLING! for eg fiesta : practicality is SUPERB! Ur key is always in ur jeans pocket ( start engine, open trunk, unlock car), interior facility( ford sync@ voice, incoming call,outgoing call,usb, phone, hug-seat, superclight steering when slowbut eghting twhen go faster. Fiesta cont : HANDLING : its one of the most stable in HIGHSPEED &CORNERING, no doubt! If drvg on highway speed 140-160km, feel very safety and relax, the steering is heavy and its make confidents & relaxing. The rim come wth 16 inch in standard. If changing the lane not feel like “terbang”/ goyang! Fiesta cont: DESIGN: in B segment the car tht come wth nice design is fiesta ,208, forte. The others is Sh** especially almera! Fiesta is one of the most favorite if refer to car reviewer at UK. In malaysia, most of commentor dont like but im sure if the commentor hv good background in fashion and music lover they will hv good feedback also! =) they donno anything about fashion and design tht why they dont good in judging the desing! Im sure 100% .about this!!! Fiesta Cont: DISADVANTAGE: TRUNK is small compre to honda vios and almera. The BACKSEAT is tight , not comfort if hv 3 rear passenger. AFtersales services is not good the other car but moderate lh! Price 86k Is among the highest cmpare to japanese car! If this not NOT AN ISSUE, u can buy FIESTA, if not , minded like typical mlysia,very sceptic about space & rear seat passenger, just buy japanese car! Because tht type of people is not for tfun driving carclike fiesta! !chill ya!